You know you have something hot on your hands when the anticipated introduction date is nearly a month away and people are already lining up to buy it. Such is the story with the new -- and highly anticipated -- TaylorMade R11 irons. Given the huge success of the R11 Driver and Fairway woods -- both on the PGA Tour and commercially, it's no wonder this new iron is garnering a lot of attention. The R11 irons are an amalgam of the popular Burner 2.0 and Tour Preferred irons from TaylorMade and feature a laundry list of features and benefits. Lets start with the fact these are a cast club -- not forged. This often leads to inconsistent weight variations and "hot spots" in the clubhead. However, TaylorMade has gotten around that with their "Precision Weight Port" system. This is a plug that is mounted in the back of the clubhead and allows them to dial in a precise weight for each club. This bright red plug is made of either aluminum, steel, or tungsten with weight variations of 2.5 to as much as 17 grams, and are not adjustable by consumers. Next comes a lively (and light face) that combines with their “Inverted Cone Technology” to deliver more consistent ball speeds and forgiveness on mis-hits. The Inverted Cone concept employs a thinner face at the center of the clubhead and thicker as it radiates out toward the edges. This allows for little loss of distance on slight mis-hits and directional deviations of only a few yards. At impact, the R11 feels and sounds quieter ("muted" is a good word) than the rather loud Burner 2.0 because the R11's clubface is slightly thicker in the impact zone as well as where it connects to the sole. There is also some progression in the R11 irons as the short irons have a shallow undercut channel between the face and rear to control both feel and CG (Center-of-Gravity) location. The mid-irons have a moderate undercut, and finally the long irons have a larger undercut that puts weight farther back from the club face for added forgiveness. Two other progressions in the set are: 1) The top-line thickness. You'll see the widest top-line in the long irons (for confidence as you address the ball) and getting progressively thinner as the irons shorten and your natural confidence increases. 2) The sole width. This feature allows a bit more weight to be added lower in the clubhead on the longer irons to help with getting the ball airborne and progresses to a slightly narrower sole in the short irons. To say there is some variety in how you can get these is an understatement of epic proportions. The R11 irons come in both Right and Left hand versions; can be ordered up to 1.5" shorter OR longer that standard (in 1/4' increments); can be ordered with the lie angle up to 3 degrees flat OR upright; and finally, in most configurations you have a choice of the KBS Steel shaft or the Fujikara Motore graphite shaft (in 65 or 75 grams) and your choice of Regular of Stiff flex. In my mind, these irons are targeted at the mid-handicapper (10-18) but with the progressive features that abound, there is no reason to think these couldn't work well for a higher handicap player as well. 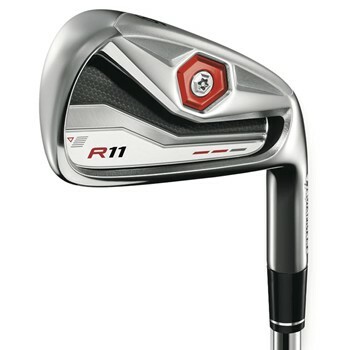 Available for shipment on September 1, 2011, the new TaylorMade R11 irons are available from a variety of online outlets, and will also be coming to local golf shops.